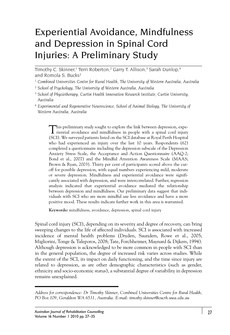 This preliminary study sought to explore the link between depression, experiential avoidance and mindfulness in people with a spinal cord injury (SCI). We surveyed patients listed on the SCI database at Royal Perth Hospital who had experienced an injury over the last 10 years. Respondents (62) completed a questionnaire including the depression subscale of the Depression Anxiety Stress Scale, the Acceptance and Action Questionnaire (AAQ-2; Bond et al., 2007) and the Mindful Attention Awareness Scale (MAAS; Brown & Ryan, 2003). Thirty per cent of participants scored above the cut-off for possible depression, with equal numbers experiencing mild, moderate or severe depression. Mindfulness and experiential avoidance were significantly associated with depression, and were intercorrelated. Further, regression analysis indicated that experiential avoidance mediated the relationship between depression and mindfulness. Our preliminary data suggest that individuals with SCI who are more mindful use less avoidance and have a more positive mood. These results indicate further work in this area is warranted. © 2010, Cambridge University Press. All rights reserved.